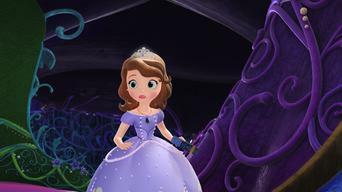 How to watch Sofia the First: Season 3 (2015) on Netflix Norway! 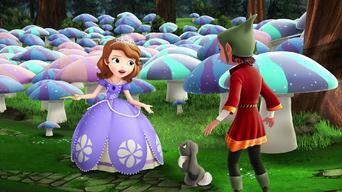 Yes, Sofia the First: Season 3 is now available on Norwegian Netflix. It arrived for online streaming on April 14, 2019. 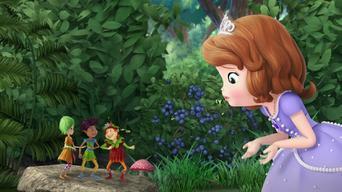 We'll keep checking Netflix Norway for Sofia the First: Season 3, and this page will be updated with any changes. When her commoner mother marries the king, average-girl Sofia finds that being a real princess isn't all it's cracked up to be. She's just an average girl whose mom married the king. Sometimes being a princess can be a royal pain. Season 1 of Sofia the First has 25 episodes. Because different Netflix countries have different availability for episodes, you'll need to check the episode listing below to see which are available in Norway. Sofia and her family go to the Flying Royal Derby. The little princess is excited to see the event and even decides to participate. 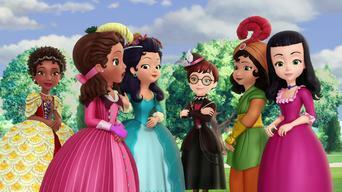 It's Sofia's first royal slumber party and Amber invites the other princesses to the event. Sofia invites her friends from town. Sofia enters the cave where the Trolls live. King Roland tells her that the Trolls can never leave their caves. Sofia has a big test coming up in her spellcasting classes, but she can't seem to get the spell down, so she asks Cedric for help. The Golden Wing Circus returns to Enchancia and the kids want to see it. But James breaks a window playing ball in the castle. The kids at school are assigned the task of designing the castle of their dreams, but it's a group project and the teachers select the partners. Sofia enters Clover in the Village Faire pet contest and learns an important lesson in friendship after inadvertently hurting his feelings. It's the day of the big princess test. Everyone gets ready with their best dresses. Mrs. Higgins asks for help, but everyone's too busy to help her. Baileywick's brother Nigel comes to visit for his birthday. The King gives him the day off, but every time they try to leave, someone asks for help. The Kingdoms of Wei-Ling, Khaldoun and Enchancia meet to celebrate a royal picnic and a day of outdoor games. James asks Sofia to be his teammate. It's Jade's birthday and she prepares a party and the whole town's invited, except Lucinda, the witch, who treats everyone badly. Everyone goes to the land of Tangu to visit Zandar. He's getting ready to throw a big party with magic carpets. 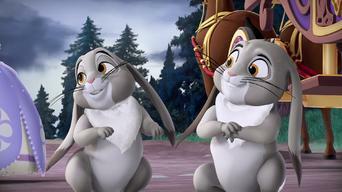 Clover thinks Sofia doesn't have time for him, so he decides to go to a wizard who can turn him into a magic rabbit. Sofia and Amber take a jewel for the royal ball. One of the griffins, the creatures who guard the jewels, escapes. Sofia wants to go on a hike with her Buttercup troop, but King Roland insists on sending Baileywick, the castle steward, to keep Sofia safe. A new fairy teacher, Miss Nettle, who was once the apprentice of Flora, Fauna and Merryweather, arrives at Royal Prep to be a teacher for the after-school gardening club. When Sofia brags about being chosen to sing the Enchancian anthem, her amulet puts a curse on her, which she must learn to undo. 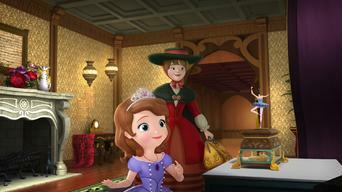 When Sofia is selected to host a Royal Prep tea party, Amber encourages her to "think big" to impress the princes and princesses. The students at Royal Prep must make their own costumes for this year's All Hallows' Eve costume contest. When Sofia reluctantly agrees to help her seemingly dotty Aunt Tilly bake an apple pie, she thinks she's in for a boring day. King Roland finds an enchanted mirror in the castle attic and accidentally makes a wish for a simple life as a village baker. 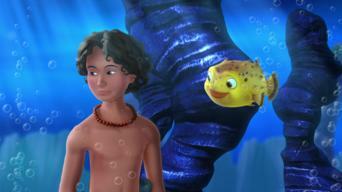 During her family vacation on a floating palace, Sofia arrives at a special cove and befriends a curious young mermaid. 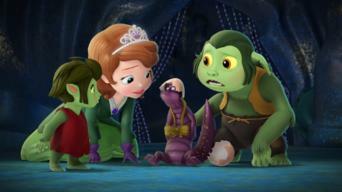 Sofia tries to find a way to convince her parents to move the floating palace to save the mermaid kingdom. When a snowstorm prevents King Roland from returning home in time for the holidays, Sofia leads her family on a brave expedition to find him. Sofia invites Jade and Ruby, her village friends, to join her and her sister, Amber, in the Flylight Pageant, an annual parade of flying coaches. 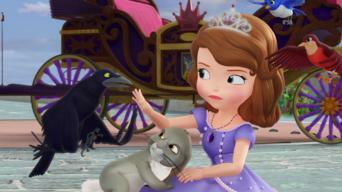 Season 2 of Sofia the First has 31 episodes. Because different Netflix countries have different availability for episodes, you'll need to check the episode listing below to see which are available in Norway. Amber doesn't want to share her birthday with James anymore, so she asks Cedric to cast a spell giving them different birthdays. When the evil fairy, Miss Nettle, tries to steal her amulet during the Enchanted Feast, Sofia gets some help from Snow White. 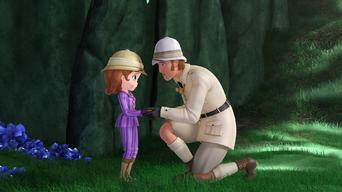 When an injury keeps James from competing in the flying derby championship, Sofia must team up with Prince Hugo. Sofia doesn't want to share her mother with her siblings at a Mother's Day picnic and asks Lucinda to cast a spell giving the two of them time alone. Sofia gets to meet her hero, Sir Bartleby, who doesn't speak because of his unusual voice, and introduces him to her Aunt Tilly. As the Enchanted Science Fair nears, Sofia and her classmates pair up to find magical objects atop a mountain, a quest that tests their friendship. With his parents away, James is made king for the day, but things get out of hand when he refuses to take the job seriously. A jealous Amber makes a wish that Roland becomes allergic to Sofia but she doesn't mean to turn Sofia into a cat! 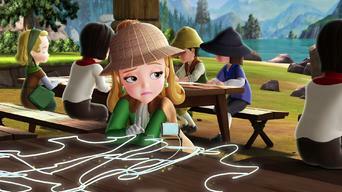 When Sofia meets Gwen, a young kitchen maid with a talent for inventing, she encourages her to follow her creative dreams. Sofia uses a spell to make a double of herself so she can be in two places at once, but the copy ends up causing trouble at the Highland Hootenanny. Sofia joins Cedric for a visit to a sorcerers' retirement home, where he hopes to earn his father's respect and his family's magic wand. 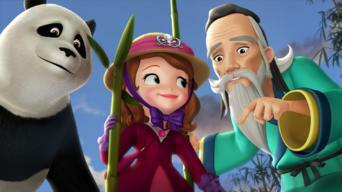 When James and Prince Jin become trapped in the kingdom of Wei-Ling, Sofia, Amber and Jun team up with Mulan to rescue them. A ghost is scaring everyone away from Sofia's big Halloween bash, but she soon discovers that he just wants to host a party of his own. When Sofia and Hildegard become trapped inside a magic painting, Hildegard's know-it-all attitude complicates their escape. Two princesses arrive in Enchancia, each claiming to own an emerald key that Sofia found. Which is the real princess, and which the imposter? 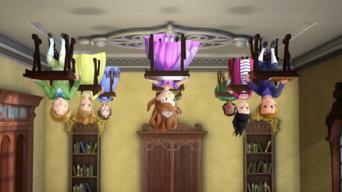 Sofia and her classmates bring their pets to school, where they get "scrambled" during an experiment in sorcery class. A new steward casts a spell on Baileywick, hoping to steal his job. But Sofia helps to make sure her friend doesn't fall into the trap. Jealous of Sofia's magic amulet, Amber steals it for herself, a deed that unleashes the wicked Princess Ivy who wants to take over Enchancia. While evil Princess Ivy tries to destroy the amulet, Amber turns to Sofia and Rapunzel for help defeating Ivy and saving Enchancia. While looking for the perfect Wassailia gift for Cedric, Sofia meets a faun in the woods who's suffering from a terrible curse. Crackle would love to sing in the Leafsong Festival but fears that she'll have to give up her fire-breathing ability to participate. When Cedric steps in to teach Sofia's sorcery class, a group of his former students play a series of pranks that threatens to get out of hand. After water floods his home, Clover moves in with Sofia. The princess is delighted, at least until Clover proves how untidy he can be. 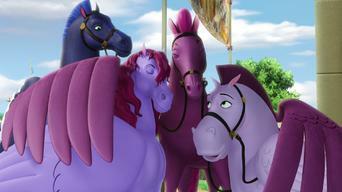 Hoping to win a big race, Ruby asks fairy godmother Tizzy to lend a hand. But the fairy's super-enthusiastic help makes Ruby sorry she ever asked. When the villagers take on the royal court in a game of dazzleball, Sofia must choose whose team to join -- her friends' or her family's. Sofia's amulet magically lets her become tiny in order to save three sprites. But when she misbehaves, the amulet won't let her return to normal size. Amber joins a troop of Butternut scouts, but a grungy overnight trip proves challenging for the princess who prefers to remain pristine. Sofia tries to do a good deed to prove that the royal family cares about the villagers, but a local hero's jealous follower thwarts her efforts. Though Sofia encourages her to try out for the school musical, gifted singer Clio hesitates because she's afraid her friend Hildegard will disapprove. It's up to Sofia and her royal siblings to save the day when a young wizard lures Minimus and Enchancia's other flying horses away with a magic lute. 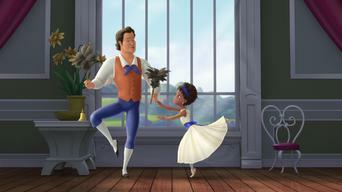 Sofia's friend Prince Hugo loves to ice dance, but he's afraid of what his father, King Garrick, will think. Can Sofia help her pal follow his heart? 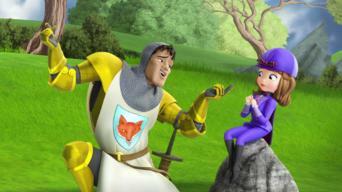 Season 3 of Sofia the First has 30 episodes. Because different Netflix countries have different availability for episodes, you'll need to check the episode listing below to see which are available in Norway. When the royal family visits Merroway Cove, Oona's brash friend Fluke becomes jealous of Sofia and all the attention she receives. When Cedric secretly gets ahold of Sofia's amulet, he wants to use it for his own gain. But the amulet doesn't take kindly to thieves. 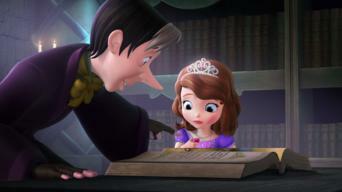 Princess Zooey enrolls at Royal Prep and starts a Princess Adventure Club. But things get complicated when Princess Amber starts a club of her own. When Aunt Tilly leaves Sofia in charge of her magical manor house, the young princess finds herself battling a trio of pesky gargoyles. When Sofia discovers a secret library in the castle, she finds that many of the books are unfinished -- and it's up to her to give them happy endings. While traveling to Tangu, Sofia accidentally unleashes a genie who sets out to grant as many wishes as possible, no matter the consequences. When an unfriendly fliegel named Grotta starts bullying Gnarly the troll, it's up to Sofia to help her friend stick up for himself. Princess Kari is naturally great at everything -- except for ballet. Sofia tries to help her friend remember that having fun is what's most important. Not wanting to move, Princess Vivian asks the mischievous Wee Sprites to trick her parents by making it appear like her new castle is haunted. Sofia is delighted to discover the enchanted land of Elvenmoor, but she soon realizes that she could get stuck there forever. Sofia visits her friend Lani, who wants to prove her leadership on a special quest. But Lani's temper has a way of stirring up trouble. After learning that Miss Nettle is taking snowdrops from Freezenburg, Sofia sets out to stop the stealing with some help from a surprising ally. 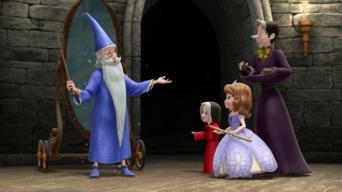 Sofia, Cedric and his niece, Calista, enjoy a visit to Merlin the wizard. But when Calista swipes Merlin's wand, things get dangerous. Sofia and Vivian take in a cute little dragon they find while picking berries, but Crackle soon discovers that their new friend is a cunning thief. While visiting town, Clover meets a rabbit that looks just like him. When the two accidentally switch places, Clover must find his own way home. While spying on people with her telescope, Amber thinks she spots a mystical creature that could pose a danger to her mother. When the Flying Starwings come to perform at the castle, Sofia tries to help their son, Minimus, gain the courage to do a stunt in their show. Sofia and the princesses go on a special Dads and Daughters Day adventure, but Sofia worries she doesn't belong because Roland is her stepfather. Sofia goes to the secret library to read about Sir Oliver, the Noble Knight, but when she and Minimus fly into the story, the plot thickens. In Wei Ling, Sofia wants to help Princess Jun cure her cold in time for the kite festival and sets out to learn if the old cures are better than new. The amulet sends Sofia to Isleworth to help Charlotte, a fellow princess who's miserable since being turned into a beast by an enchantress's curse. Lucinda invites Sofia to her Cauldronation party, where she'll be made a true midnight witch, if Sofia can stop two rival witches from ruining things. Sofia, James and Amber head to their first summer camp, where Amber has a hard time adjusting, and homesick James plots an escape with a new friend. Miranda's sad that the family is too busy to spend quality time together, so Sofia suggests a family vacation, but things don't go exactly as planned. 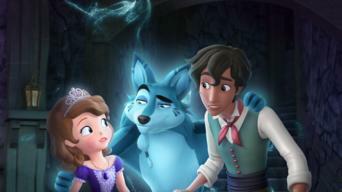 Sofia goes to the library for the truth about the amulet and learns that Princess Elena of Avalor was locked inside it trying to save her people. Sofia gets help from new friends in Avalor and finally frees Elena, but that's only the first step in saving the kingdom from the sorceress Shuriki. Shuriki's jailed Sofia's family and trapped Elena's in a painting. But with help from the Avalor people -- and some magic -- they may have a chance. When the amulet starts to change, Sofia consults with Cedric, who suggests they visit his old school, Hexley Hall, where things have also changed. The Royal Prep band impresses at a music competition, thanks to Vivian's magical playing, which inspires a famed musician to try to steal her talent. When Sofia, James and Amber return to school, they're promoted to the Majestic class but find professor Pecullian's methods a bit peculiar. Season 4 of Sofia the First has 30 episodes. Because different Netflix countries have different availability for episodes, you'll need to check the episode listing below to see which are available in Norway.